My youngest son and I started CrossFit in July. To say that we are both hooked is an understatement. We signed up as partners for our first competition in November, I am a bit nervous, but he says “whats the big deal”. One of the center ideals of CrossFit is a community and each ‘box’ which is the slang for the gym, puts together community building events where everyone can get together outside of their sweaty workout clothes, and get to know one another. This last weekend our box had a party to celebrate their one year anniversary of being open for business. I enjoyed seeing everyone all dolled up and getting to know those that workout at different times. I had a wonderful conversation with a few members about our diets, how we eat, what we eat and how darn expensive it can be to eat the way we want. I love meeting and talking with others who are as passionate about fitness and nutrition as I am. That is what is so great about this recipe, there are a limited number of ingredients but tons of flavor. I can’t express enough how delicious this soup is. I always have it for lunch the next day with a salad and freeze any extra. One of the ingredients you might not have heard of; arrowroot. This is used in place of the flour in the roux, as a thickener. You can also use tapioca flour. Both can be found in your organic section at the grocery. I use Bob Red Mill’s Natural foods arrowroot. 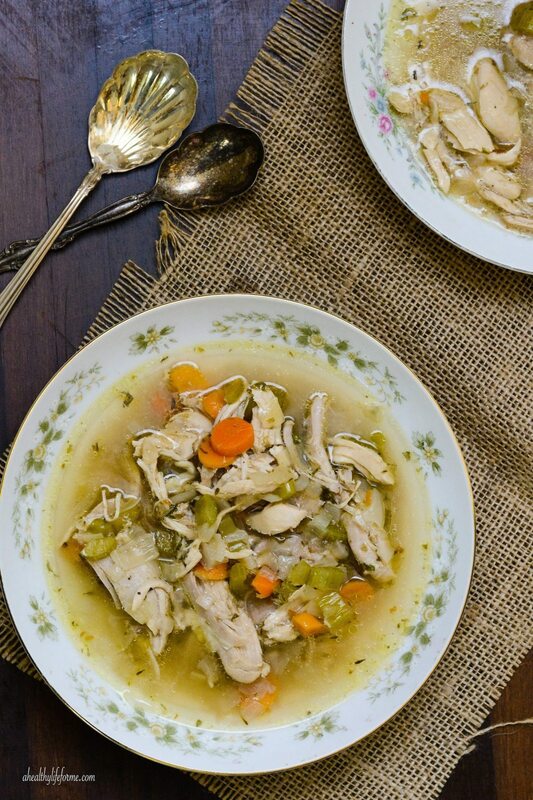 Add chicken; reduce heat to low, cover, and gently simmer until chicken is tender and cooked through, 20–30 minutes. Remove chicken; let cool slightly and shred into bite-size pieces. Bring broth to a boil and cook until reduced to 8 cups, about 15 minutes. Meanwhile, melt ghee in a small heavy saucepan over low heat. Whisk in arrowroot flour until smooth and cook, whisking constantly until roux is pale beige in color, about 15 minutes. Scrape roux into simmering broth; whisk until thickened and broth coats the back of a spoon. Reduce heat to low and add vegetables. Cook until tender, about 5 minutes. Add shredded chicken and herbs. Season with salt and pepper. 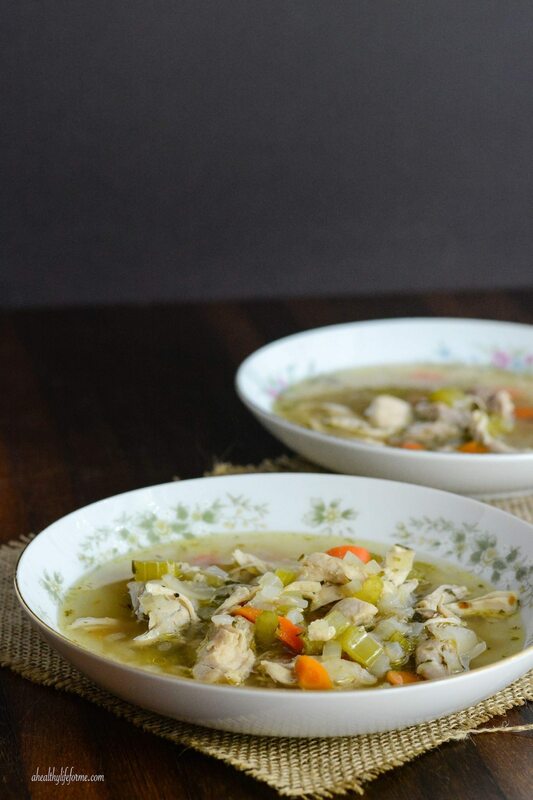 I needed this last week when I caught a cold – I’ll have to make a big batch and freeze for next time! I actually feel like I’m coming down with something, so I am ALL over this! Gorg photos too! This looks delicious! Definitely need some individual portions in my freezer! Not dairy free though as stated !!! This soup looks divine. I especially love the fresh herbs in it. Good Luck in the competition. I bet you will do wonderfully. I love this so much!! Good luck, this surely is a winner! 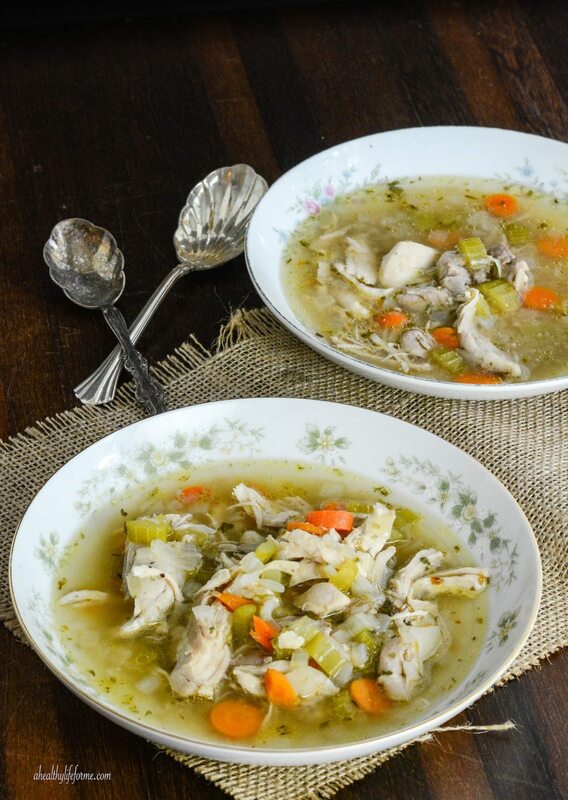 This chicken soup is magical! Was my first time making a roux and nailed it. Used 4 cups of homemade beef broth and then the rest chicken stock. The flavor was incredible and I was really surprised at how thick the soup became. Thanks for the recipe, glad I found your blog today! Have made this recipe a few time and absolutely delicious! Will make a big pot next time to freeze but a quick and easy recipe. Thanks for sharing.